#Farmville & Other Zynga Games go Gift Card…. Now it was time for the elusive search for gift cards, First choice was Home Depot, the second was, well I didn’t know but was willing to seek and find. I found a Dunkin Donuts card which is better than Home Depot. EXCITED! 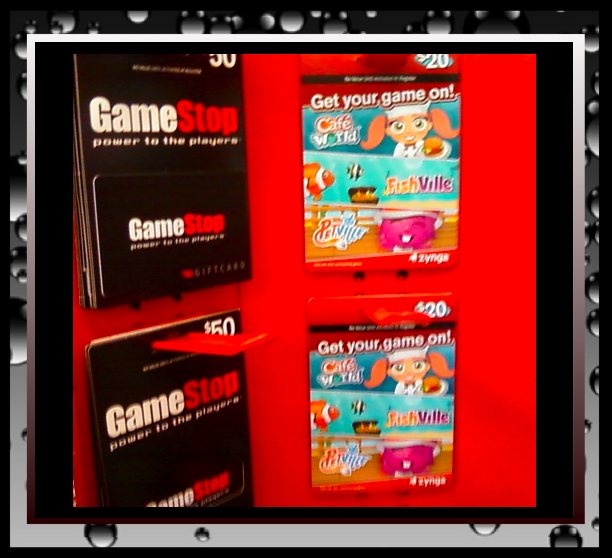 As I was searching I notice an entire section of gift cards for Zynga Games, Famville, Zooville and more. My question is why would one need a gift card for a free Facebook Game. I do admit to having a temporary addiction to Farmvile that was cured by grad school. I do not remember anything that required payment of any sort. What would one buy with a gift card? Is it now a requirement to play. So I guess I’m really wondering if all online games will cross to outside of the scope of the original context of the game to the gift card business? If so as players will is soon be a requirement to pay to play. Is this the NEW form of Gamification? As usual, I welcome comments, good, bad, ugly or indifferent. So feel free to comment, catch me on Twitter or post directly to my Facebook Wall.